Download this Checklist: What to Do AFTER You Get Publicity, a.k.a., Got Press, Now What? OH, THAT MOMENT! The moment when the publicity – big or small – that you worked for debuts for the world to see. Yes, it’s exciting, yes, after the work you possibly put into getting to this moment, you might be ready to exhale loudly and move on to chasing your next press “hit” or moving on to another item on your to-do list, but that would be a huge mistake! The truth is, the moment you get publicity, you have another opportunity presented you – one that allows you to leverage that press into even more buzz, visibility, media relationships – perhaps even sales! You worked hard for your press success, now you need to make it work for you even more. If you’ve been had the phrase, “I’ve got press, now what?” cross your mind in the past, this post is for you. 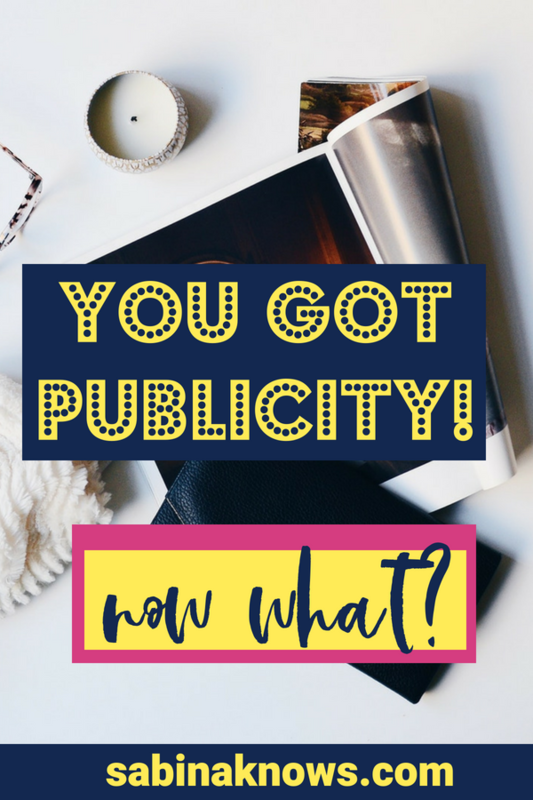 If you haven’t received publicity yet but it’s one of your goals, read through this list and learn it now, so that when the moment comes (and if you’re a Press for Success student, your chances of it coming are high), you’re prepared! Read through the list below, download it via the link at the end, print it out, and get ready to get exponentially bigger buzz than before when you get publicity in the future! Do a happy dance, high five yourself, get a celebratory donut, you name it! Just be sure you anchor into this success that came from your hard work! For starters, what we think about expands, so try to spend plenty of time daily focusing on what is going right! Also, you deserve a celebration, for publicity big and small. Not only did you put in the work, you flexed your courage muscles and took a chance, and that deserves to be rewarded! P.S. Do a happy dance on InstaStory, tag us (@sabinaknows, #PressForSuccess) and we’ll high five you right back! Share your press on social media, but don’t just post once! Schedule posts into the future, and be sure you tag the featuring media contact & outlet in your post. Let’s face it – social media is a constantly moving river of information, and posting your press success only once is going to mean that a large part of your audience may miss it. And what about three or even six months from now – what about your new followers? Don’t keep this always-valuable news from them. Keep this press mention alive by scheduling future posts using a social media scheduling App. Another way to re-introduce past press (and any content you want to get fresh eyeballs on) is sharing it in a #TBT (Throwback Thursday) social media post. Remember: People want to celebrate with you, and people want to see your business validated by an outside, trustworthy party like the media. It’s imperative that as many people see it as possible! Share news of your publicity in a newsletter spotlighting it (don’t bury under other topics). Be sure you don’t just include an outside link that leads them directly to the media website you’re featured on. If you do this you’ve not only lost them, but you’re leading them to discover other businesses. Instead, use the newsletter to tempt and tantalize them into coming to your blog or website to see and learn more about this press opportunity. Let them know what they’re going to get out of clicking over to read more – behind-the-scenes scoop? A special celebratory promotion or sale to mark this moment? Even more information or tips beyond what you shared with the press? The full TV clip? Let them know what they’re getting, beyond “Hey, my business got publicity”. Show your readers what’s in it for them! Like I said above, you want to showcase your publicity on your own website, and doing so by making it part of a blog post allows you to be sure your publicity lives on for years to come (and new eyeballs to discover) on your blog. Link your newsletter here and include extra scoop about the publicity to raise its value! If possible, link to the products or services mentioned in your publicity, from the blog post. Don’t want to write a blog post for every single piece of publicity you receive (especially smaller “hits”)? Do monthly or quarterly business highlights wrap-up posts and include them there. What better way to celebrate your publicity success – and encourage people to shop the item or service that the press just validated, than by hosting a sale to mark the occasion. This can be a sitewide event or limited to specific products or services, or even offer free shipping for a limited amount of time. The point is, someone other than you just put a spotlight on your business, and a sale (if it fits into your company’s business model) can be a lucrative way to leverage that. Remember to include logos or links to the publicity you receive on your website’s press pages, and depending on the outlet include logos on your homepage, or wherever else is suitable considering your website’s design aesthetic. Another important spot to mention this publicity that often gets overlooked is including your press “as seen on” on actual product and/or service sales pages. Just think about it: Someone is hovering on a product or service sales page and then they see your positive press mention. It could be just the validation they need to pull the trigger on that sale! Trying to land a wholesale account or other business partnerships or opportunities? Include news of press in your ongoing outreach emails! Remember, like all publicity strategies, this is an art, not a science. Do you need to alert them of every single publicity moment big and small real-timeime? No. But when you are actively executing outreach for sales, cross-promotion, or any other type of partnership, drawing attention to your publicity success is vital. This demonstrates that people are talking about your business, and depending on the publicity, can ensure your possible partner that eyeballs and customers are already being made aware of you. Sharing press success here is definitely a win-win. Don’t forget to always record your press success in your PR Home Base (if you’re a Press for Success student) or anywhere else you track your media outreach. Just because they’ve given you publicity once doesn’t mean your relationship with the media who featured you is over! Continue to reach out to them when you have news, tips, or products that are of value to their audience! The best way to be sure you – and anyone on your team – don’t forget to take advantage of every opportunity you have to leverage your publicity is to have your “Got Press, Now What?” Checklist hanging somewhere near your desk or saved onto your computer.